The Terraultra is a brand new shoe in Inov-8’s range. It is available in two versions; the G260 and the 260. The number refers to the weight in grams of the shoes in a sample size UK8 and the G refers to a Graphene edition, which has had the special material added to the outsole of the G260 to make the sticky rubber last longer. This review is about the Terraultra 260 with no G.
The Inov8 Terraultra is a zero drop trail running shoe. That means the heel isn’t higher than the forefoot, creating a downward slope, unlike most running shoes. This is to promote a more natural gait, encouraging you to land on your midfoot with the foot striking the ground under your centre of gravity. Shoes with an elevated heel promote more of a heel strike and often cause the foot to strike the ground in front of your centre of gravity. That causes a breaking force and waste of energy and momentum! In effect you stop yourself as you hit the ground and must push off to get going again. If you aren’t used to zero drop shoes then it’s advisable to build up the time you spend in the shoes gradually, alternating with your previous shoes. It’s easier to make a transition to zero drop when running off road, as on more broken surfaces you tend to run with a shorter stride and your stride pattern is less regular. That means you aren’t stressing the same part of your body with each foot strike. The shape of the toe box of the Terraultra 260 is more rounded and foot shaped than other Inov-8 shoes. They aren’t as broad as Altra or Topo, which some people find too roomy on occasion. If you’re a fan of the Low or zero drop and toe box shape of these brands but aren’t so keen on the width then these new Terraultra 260s are worth a try. The mesh upper has a lovely fit that pulled in around my foot and with narrower feet it left space for my toes to spread, which was great. This was a sharp contrast to the fit of the G260 version where the upper is much stiffer and had more of a boxy type fit. The shoes are also nice and flexible and get more so the more you run in them. The cushioning isn’t too soft and and the Dynamic Fascia Band gives the shoe a very springy feel. The first run out in them was intended to be 30 minutes long but, I ended up being out for over an hour. The combination of the springy feel and flexibility made the Terraultra 260 a joy to run in. They have become the shoe that I use for my easy morning runs of an hour or so four times a week. The surface varies from a mile or so of tarmac road at the start to disused railway lines, rocky tracks, farmers fields and thin muddy paths through the woods that are covered in tree roots. It is still very dry, so I haven’t been able to test the outsole out in real wet conditions, but it has coped very well on such a mixture of terrain. Most of us in the UK are running on a mixture of terrain when we go off road, often down the road to where your off-road spot starts. You aren’t aware of the studded outsole on the hard surfaces and on the slippy surfaces the grip has been ample. 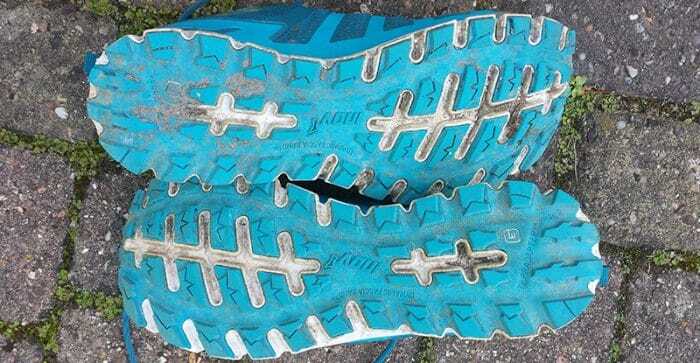 The flexible sole is particularly good on the rough single track as the shoe bends to the ground so you don’t get thrown around like you do in stiffer shoes. The result is you can confidently make good forward progress! The other advantage of Zero Drop when you are running off road is that your foot is much more stable. This means that there is far less of a chance of you twisting an ankle or knee when running on rough ground. You can also feel this added stability so you feel more confident on rough descents than you do in a shoe with an elevated heel. The outsole of the Terraultra 260 is made from Endurance Rubber unlike its sister shoe, the Inov-8 Terraultra G260, which has a sticky rubber outsole blended with Graphene to give a sticky grip with durability. It is hard to fully test the Endurance Rubber in the wet when it has been so dry. However, there have been wet days and we now have dew on the grass every morning, on both of which it grips very well. It might not give the same performance as a sticky rubber on wet stone slabs or wet wooden bridges, but I personally feel confident in them.. and for the trail running that most of us runners do, the performance will be more than ample. Altra Lone Peak 4: Zero drop, wide foot shaped toe box. More cushioning underfoot less of a feel for the floor and not as flexible. Altra Superior 3.5: Zero drop, wide foot shaped toe box. Similar cushioning level. Not quite as flexible but, very close. The grip isn’t as aggressive but, is a sticky rubber. The Superiors has a softer feel than the Terraultra. Topo Terraventure: 3mm heel to forefoot. A broader rounded toe box than the Terraultra. Not as flexible. More cushioned but, still has a firmish feel to it. The outsole isn’t as aggressive.